on CAS sheets. This section of the chapter will cover the procedures used to identify those "hard-to-get" materials, the techniques used to track them through home port and on deployment, and how to maintain accountability of your money and materials. Home port is the time to plan your projects and identify what resources it will take to complete them. The first two things to learn is where your materials will come from and who is going to pay the bill. To minimize cost, most of your project materials will come from the Continental United States (CONUS). 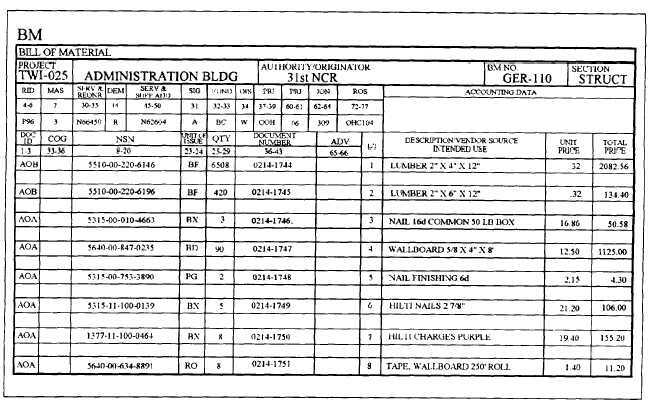 Most materials ordered on the deployment site are bulk items like cement, concrete, aggregate, sand, CMU block and such. Bulk items are too expensive to ship. It is the goal of 2ndNCB/3rdNCB to have 100 percent of your critical path materials on site at project start. It is your responsibility to be sure they know exactly what these critical path materials are and when you need them. After plains and specifications for your project are drawn up, bills of material are generated by either the 20th or 31st NCR planning and estimating staff. You will receive copies of these BMs about 5 months before you deploy. These BMs must include everything you need to complete your project! These BMs usually include construction materials, plans and specifications, special tools, and safety gear not already in the battalion's table of allowance (TOA). Any technical assistance you may require, such as balancing an HVAC system or certifying a fire alarm system, also should be listed in the BM. Not only do you have to ensure the regimental staff identified the right tools and materials, but you also have to ensure they identified the right quantity. Figure 3-14 is an example of a BM. BMs are arranged by material type - structural, electrical, mechanical, or such. Your number one job in home port is to make sure the BMs contain all the material you need to complete your job!